Mining citations in the PubMed database, the researchers found evidence that when a prominent researcher suddenly dies in an academic subfield, a blooming of new ideas and innovation follow. They identified 12,935 “elite” scientists — based on the amount of funding they received, how many times they’ve published, how many patents they invented, or whether they were members of elite groups, such as the National Academies of Sciences or the Institute of Medicine. They found 452 of these elite researchers died before retirement. As science leaves a dense trail of citations, publish dates, and authors’ hierarchies, it’s possible to track changes in publishing patterns after the permanent eclipse of a prominent star. After the death of a rock-star scientist, their frequent collaborators and tag-alongs — the junior researchers who authored papers with them, often enslaved to them — suddenly see a drop in publications. At the same time, there is a marked increase in published work by other newcomers to the field. So Why Should Nations, Those Super-Tribes Of Europe, Vanish Under A Flood Of Invaders? Plutocrats all over loudly clamoring that Syrian refugees should get preference over Natives so destitutes, they can’t even reproduce: contemplate Germany, with the world’s worst reproduction rate, and now one million mostly Muslim refugees admitted in eleven months (the European Union accepted hundreds of thousands more, including three whose calling was to kill as many people in Paris as they could). It seems only natural that Natives would get preferential treatment above Non-Natives. Some claim that open borders, the open society, welcoming invaders, is so superior in all ways, that it should be embraced at all costs. The argument was rolled out first by Pericles. However, within 30 years, half of the Athenian population was dead, the city occupied, and only Sparta saved Athens for eradication. Opening up a country to the max works, as a complement. But, throughout the West, we observe decay, to the point the Natives cannot afford to reproduce. Instead, it is proposed to generously import millions of Middle Easterners… Many armed with a version of a religion which hates the West (9/11, the Paris and San Bernardino massacres were fully, or partly organized by such imports). Who wins from importing invaders and weakening the Natives? International plutocracy, as above local laws as it is above decency, and the nations it crushes. Unsurprisingly, the same international plutocracy owns the Main Stream Media of the West. A tycoon such as Murdoch could move from Australia, colonize Britain, and then take over the USA (where he owns plenty, including Fox News and the WSJ…) And then the MSM tells the little people, and persuade them that, the worse their condition gets, the better, as long as they are generous to strangers from far-away lands (such as the aforesaid plutocrats). The more the fate of the Natives of the West looks ominous, the more they will revolt against their oppressors. Hopefully. And those oppressors are those who have molded minds in the West. Thus the minds of the people have to fight themselves. This is why a site about cuddly kittens will get thousands of “likes” a day, and an enormous readership, whereas a serious site such as this one has generally to make do with none. Let the force be with you, and direct it first towards those poisonous moods and thoughts which have brought your stealthy demise. Following the leader materially helps, but can be entirely nefarious, morally speaking. By condoning the Catholic Church often monstrous morality, and the exploitation of women, the Catholic church has found another diabolical leader to make a saint of. 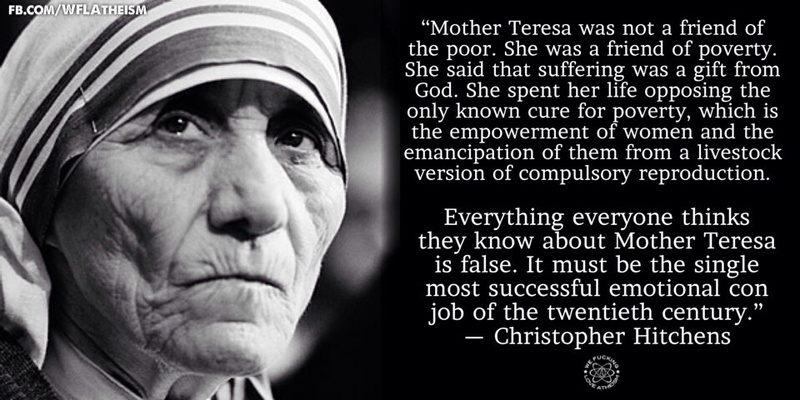 Mother Teresa was mostly a self-interested ambition sucker, anxious to make Pope John-Paul II feel good about himself (she was hanging around the Pope’s ear in the Vatican, a plushy place if there is any!). But she is a saint says the same tribal organization which promptly made “Saint” Louis (IX), who wrote that nothing would please him more than torturing to death “unbelievers” and Jews. What’s the main reason for tribes? Death. Giving death, avoiding death. Just study Saint Louis. Just study Teresa, and her pain and death obsessions. And tribal effect can cause death to new ideas, not just people, all over, not just science. Plutocracy is its own tribe, and its survival depends upon free markets, open borders, tini tiny local laws which big plutocrats can fly over, and the general world order the 99% suffer from in the West. Planck and the economic researchers we quoted above push us towards the following conclusion. You want innovation, and a blooming of art, thought, ideas, and justice, and a young world? Please help visit upon plutocracy an early demise! Civilization is technological, or is not. Civilization is progressive, or is not. Why? Because resources get exhausted: sustainability is always unsustainable. We need bigger solutions. Or we will keep on sinking. Speaking of students, Krugman is progressing in his awareness of the socio-economic situation. So is Obama who made a confused discourse about inequality (in Obama befuddled brains, the solution to inequality is more free market, Obamacare style, as he reminds us in his incoherence… and then joins stupidity to insolence by asking us if we have a better solution; well all advanced countries, but for the USA, have a solution: public health care). Obama is a piece of flotsam moved by the tsunami of plutocracy unchained. He mentioned innovation, correctly. However his administration has made strides against it. As always, in the name of the so-called tech giants (truly plotting monopolies). As nearly always, implemented reality is the opposite of Obama’s lenifying discourses. 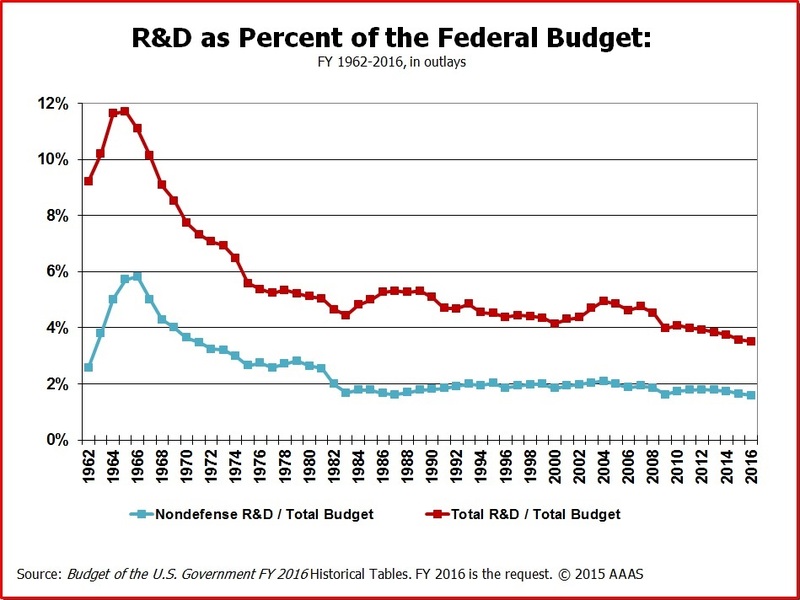 Intellectual Property (IP) has been seriously gutted out for the little guys (aka the inventors) since 2008. The Obama administration has engaged in a war against “trolls“, an ill-disguised campaign for the largest corporate actors (ignoring that IP is fungible, the very principle of patents and copyright). The Federal Circuit came up with a weird decision, AGAINST “injunctive relief”. Large corporations can infringe in peace. Moreover the Supreme Court decided recently that large damages amounts are more difficult to prove. NOW, if a corporation infringes on a patent, “apportionment” has to be effected. This is a three-pronged attack against innovation. But the pawns march on. March of the drones, all lined up behind the drone-in-chief. The best way to get to get to Greece or Zimbabwe, as a society, is through rising inequality. Because tremendous inequality is what characterizes these societies most. In turn, it generates other ills of an overwhelming nature. Economic inequality, at some point transmogrifies and changes dimensions, becoming fiscal and then political inequality (as presently in the USA). In the next step, even the appearance of democracy erodes (see Bush versus Gore, when a correct recount in favor of the on with the most votes was… outlawed). Aristocracy and fascism arose from economic inequality. This was known for 26 centuries, and acted up by the creators of Greek democracies and the Roman Republic, through redistribution of wealth, or out-lawing the rise of hyper wealth. There was a law in Rome blocking great wealth; the non-respect of this law brought civil war between the People and the plutocrats; the plutocrats won… until the Franks took over, 650 years later. If we go full paleolithic, we will worry about food on the table, and energy. Both are under threat. Human organizations have to rise to the challenge. The distinctions between public and private, when a crisis gets strong enough, are irrelevant (look at WWII when Britain and the USA adopted economic command and control). The economists have failed to understand that, inasmuch as too much central planning is bad, so is too little. Part of economic theory ought to address the part of the economy that is public, not just the “free”-market, for profit part. We do need governmental projects, not just government money (especially not just money sent to private banks). If Inertia Confinement Thermonuclear Fusion could be made to work well enough, for example, all our energy problems would be solved. Fusion break-even was just achieved at LLL national laboratory; the only other project that way, worldwide, is from the French government. That sort of huge project, with potential giant, civilization changing impact, is only made possible from the largest economic entities around, governments (or even union of governments, as with the LHC, and ITER; these are not just science projects, but economic enterprises of incalculable cost… literally). The stupid sequester had an impact on thermonuclear fusion: researchers were ordered not to even reveal the breakthrough they had achieved. The fascist plutocratic Roman imperial government was adverse to real scientific innovation (as ideas threaten plutocracy). However, its barbarians enemies caught up with Rome technologically on the battlefield. That resulted, not just into defeat on the battlefield, but in the permanent outright replacement of Roman Army by the Franks (after experimenting with the Goths, and even the Huns). Contemplate the Chinese dictatorship trying the first soft landing on the Moon, Luna, in 37 years; contemplate the fact China can access space at this point… But the only way Americans or Europeans get to space is by paying mentally unstable KGB dictator Putin. Another factor in the fall of the Greco-Roman world was the exhaustion of resources. This had started early on, when, for military reasons (building the Athenian anti-Persian War Navy), Athens had eradicated the forests of Attica (500 BCE). Seven centuries later, the crisis was major, and multi-dimensional. By 1300 CE, a similar crisis was affecting Western Europe. Half of the population died in short order (even more did during the Dark Ages). Yet, this time, innovative solutions were enacted swiftly, and civilization barely missed a stride (although, soon, horrendous religious and plutocratic wars wrecked the West). The powerful kept supporting the loftiest intellectual ventures (just the opposite of what happened in Rome, when fake, mediocre intellectuals were supported; mediocre intellectual advice is worse than none). Innovation is not just a central to the economy, but to the survival of civilization. But to have innovation, one needs the People experience enough equality to push for it. Although it humbles me to admit this, the Christian Church, with its strong socialist tendency (thank you Jesus), limited plutocratization: after all, kings in good standing washed the feet of the poor. Not just this, but the Church, whatever its insanities, was viewed as of unimpeachable advice, even by the mightiest. That’s another safeguard that has ceased to exist. The rumor has it that Pope Francis, by taking strong positions against organized crime and hyper wealth, also known as plutocracy, is endangering his life. Even in the darkest of the Middle Ages, this was inconceivable (forgetting the special case of Philippe Le Bel). Once a (German-Italian-) Roman emperor, Henry IV, was forced to humiliate himself on his knees waiting for three days and three nights, naked below a shirt, fasting, before the entrance gate of the Pope’s castle, while a blizzard raged in January 1077. Nothing can humiliate our plutocrats as much nowadays. It’s in our hands. Let’s make laws. Let’s make a worldwide register of all properties. Then we can tax the pirates and profiteers, let alone run of the mill, .01% plutocrats. Representation without taxation is a bad joke plutocrats played not just on us, but on civilization itself. Note: China just made the first soft landing on the Moon in 37 years. Well, Obama is already there! OK, the Franco-American robot “Curiosity” on Mars is more sophisticated with its (French Thales) rock blasting laser. Yet, a warning: the Jade Rabbit is supposed to look for Helium 3 (a thermonuclear fuel). Excuse me: economics was named and conceptualized by Xenophon, 24 centuries ago. Differently from physics, that was practiced only partly and primitively, economics was already highly advanced, 25 centuries ago. For example, the 200 trireme Athenian Navy that later defeated the monster Persian plutocracy was built, at huge ecological cost, with a public-private partnership system. Adam Smith himself went to learn his stuff at the feet of French “physiocrats” who flourished 240 years ago (the head of that school was the top surgeon in France). As I have argued, the sort of public-private government sponsored technologically progressing economy we need today was fully, and self-consciously, in command of France in 1600. Hence Henri IV’s slogan “workers ought to have a chicken in every pot”. A cursory inspection of history show that, from dams in Yemen, thousands of years ago, to the Roman army building roads, to Caesar’ draining the swamps to the construction of China or Europe’s canal systems in the Middle Ages, the biggest picture, in economics, is from the government. At this point there is plenty of evidence that, in the USA, government disfunctionality is bringing the real economy down. The main actors and agents in today’s economics originated in government. Look at, say lasers. They were made possible by Kastler’s discovery of Optical Pumping in the Normale Sup lab 100% financed by the French government. More recently, the same lab, still funded 100% by the French government, found how to count photons, without destroying them (that was also rewarded with a Nobel). Nothing that interests private, for profit entrepreneurs, today, but, no doubt, one of the pillars of the future sci-fi economy. Economics will continue to be dismal as long as we don’t focus on the scientific understanding of growth and innovation. Imperial Rome went down because of a deliberate effort against elite innovation; leaving the field to be dominated by simple generals such as Diocletian… Instead of the top-notch intellectuals the best regimes throughout history surrounded themselves with. In physics one studies, to start with, friction-less trains of mass zero, to teach basic dynamics. Similarly fans of economic theory as taught in USA schools say that economics is like other sciences: economics starts with simplified, basic formulas. They opine that basic market theory assumes that goods are available as needed to be purchased by consumers with “perfect knowledge.” As one advances to higher-level classes, one learns the corrections for effect of advertising, imperfect knowledge, and externalities such as polluting air and water. Nice. And that’s indeed what is taught as “economics” in the USA and all and any organization that advocates the economic system thriving in the USA (complete with a for-profit, “marketplace“, Obamacare). But this is all wrong. Reducing economics to the market’s inner guts, assumes a plutophile vision of economics. It assumes that economics is all about, and only about, the “free market”. But there is no such a thing. A market is never “free”. What looks “free” is actually government regulated. Even ‘deregulation’ is government regulated. What looked like financial deregulation under Clinton was actually the regulation of providing the largest financial actors with a number of advantages on smaller actors and over the rest of the socioeconomy. Even more fundamentally, giant economies, such as the Inca empire, or (a large part of) Late Rome did without free market, and thrived. Economically (that Rome thrive economically until overrun by savages is a recent and surprising discovery in 21 C archeology). Stalin’s “free-market”-free economy thrived enough to vanquish Hitler. Nazi economists were so sure of the superiority of their free market, they thought there was no way it would not take more than a few months to destroy the “command and control” USSR. That illusion did not survive contact with Soviet made and conceived T34 tanks. To add injury to insult, the Soviets were then able to out-produce the Nazi style free market. The UK and the USA used a command and control economic model similar to the one used by the Soviets to out-produce the Nazis. Mass production concentrated on very few types, decided from above. The USA effort was headed by a young Canadian economist, Galbraith. Nowadays, the People’s Republic of China’s economy, which uses a lot of command and control of the economy, has been persistently doing much better economically than the “free market” West. So “economics” is a much larger subject than just what American economists call the “free market”. That the biggest picture, in economics, is from the government is the perspective that eludes persistently American economists. In economy, God is not the market. God is the (hopefully democratic) government. If the government is democratic, most people will profit from the economy beyond mere subsistence, and so more minds will partake in the society, making the civilization smarter. A virtuous circle of involvement. And what economic science ought to guide the government? Not the free market, assuredly, as this is the creature of the government. The government needs to be guided by real, all-encompassing economic science. What could be a proper foundation for the whole science of economics? Energy. Just as in physics. Just as what is desperately in need of regulation now. See fracking, and the just uncovered fact it’s about 50% of USA greenhouse emissions right now. Of course that will tell Obama nothing: he is not really the guy governing right now. It’s rather the creature down below that is governing, a magma of a few thousands plutocrats with crocodilian aspirations. They govern the jungle that feed them, complete with economists perched on the highest branches, eying the scraps left by the kills they gorge on. Henri IV used the word “laboureurs” (from the Roman word, laborare, to work). That, of course gave the English “laborers”, and “labor”. So, three centuries before Henry Ford, Henri argued that workers ought to be paid enough to be well fed. Something denied to 50 million citizens of the USA (many of them working, see preceding essay). Today.